The glorious clockwork contraptions of Jacques Tati don’t so much feature characters as they do human rats scrambling through mazes of their own creation. Even the director’s alter ego, the hat-wearing, pipe-smoking blunderer Monsieur Hulot, is more of a reoccurring background player than a protagonist. Despite its title, Monsieur Hulot’s Holiday (1953) can’t quite be called a starring vehicle for the Tramp-like creation; his clumsy misadventures occupy only a fraction of the running time, which is split fairly evenly among the vacationing guests at a seaside resort. Tati reprised the role five years later in Mon Oncle, a superior sequel that kept its “main” character on the periphery. By this time, the French filmmaker was already growing into his signature style—an approach to satire predicated on elaborate sets, careful blocking, and uproariously malfunctioning machinery. 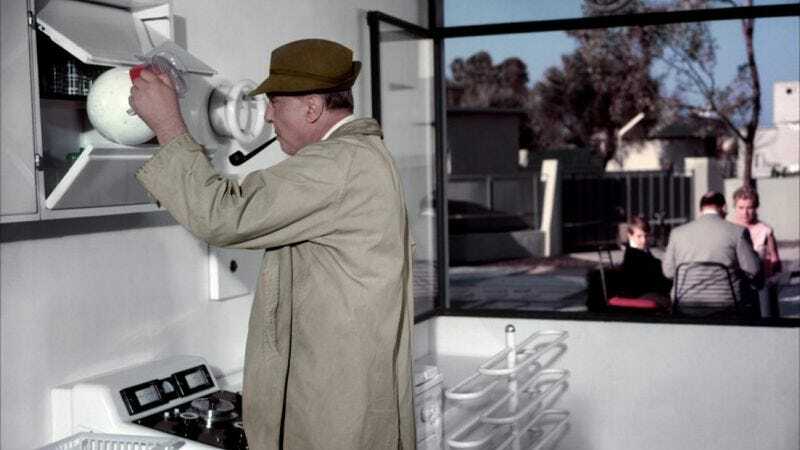 Hulot, while hilarious, is no more important to Mon Oncle than a faulty, fish-shaped water fountain. Tati shot two versions of the movie concurrently—one in French, the other in English. Despite minor differences, they’re essentially the same inspired comedy: Hulot leaves his bohemian Parisian digs to visit relatives in the ’burbs, discovering that his sister and nephew are living in an extravagant, largely automated house-of-the-future. Much of the humor is at the expense of the community’s wealthiest residents, whose commitment to fashion over function has forced them into a modern life of inconvenience. Some of the chairs, in a particularly amusing example, are almost impossible to actually sit in. Elsewhere, in one of the movie’s funniest set pieces, the sister and her husband become imprisoned by their garage. Pointed though it is, Tati’s satire never seems mean-spirited; he’s more tickled than outraged by the follies of contemporary polite society. His sympathies seem aligned less with Hulot, who remains an unknowable, sporadically destructive tourist in this brave new world, than with a band of latchkey youths creating trouble on the movie’s margins. Orchestrating traffic disputes and causing pedestrians to crash into things by drawing their attention at just the right second, the kids possess a mischievous understanding and control of the world’s mechanics that make them clear surrogates for their prankish creator. Tati would soon master these laws of cinematic physics in his masterpiece, Playtime—an ultimate refinement of the director’s style, destined to disappoint only those who demand more, not less, of the lovably bumbling Hulot. Availability: The French version of Mon Oncle is available on Criterion DVD, which can be obtained through Netflix. Though it received a brief, limited theatrical run a couple of years ago, the English version (My Uncle) remains much harder to track down.